There may be a limited number of lines available to handle queued calls. There may not be enough agents actively handling calls on a particular day to complete all callback requests. To set up Call-Back Limits, click the tab Call-Back Limits tab at the top of the page (1). Max Call-Backs (2) will determine the maximum number of call-backs that can be in the queue of a target at any one time. This may be increased or decreased based on requirements. When this maximum is met, no new call-backs will be started. Fonolo will continue to accept incoming call-back requests from callers and start them once the total number of concurrent calls drops below the configured threshold. When turning on Call-Back Limits, a reasonable value for the Max Call-Backs MUST be selected. If selecting a value that is too low, this could create a build-up of call-backs that your Agents may not be able to get to. Setting this value to zero will prevent ALL call-backs to this Target from being completed! Queued call-backs are held by Fonolo in the Real-Time View until being placed into the queue. For Queued Call-Backs, you have the option to ‘Export’, or ‘Export and Remove’ the call-backs. Exporting the callbacks will download the call-back stats of all waiting calls into a .csv file on your computer. Exporting and removing the callbacks will export the data, and also remove the call-backs from the system, preventing the call-backs from being made. Queued call-backs that have not been processed by end of day are called the Daily Overflow (3) and can be managed in the Daily Overflow section. Only when the number of concurrent call-backs drop below the specified maximum, and only when scheduling allows, will Fonolo continue to process any additional call-backs. At this point, you can either Save Changes (4), or add in additional Scheduling (5) information for Call-Back Limiting to further customize the way that this feature will impact your Fonolo call-back service. 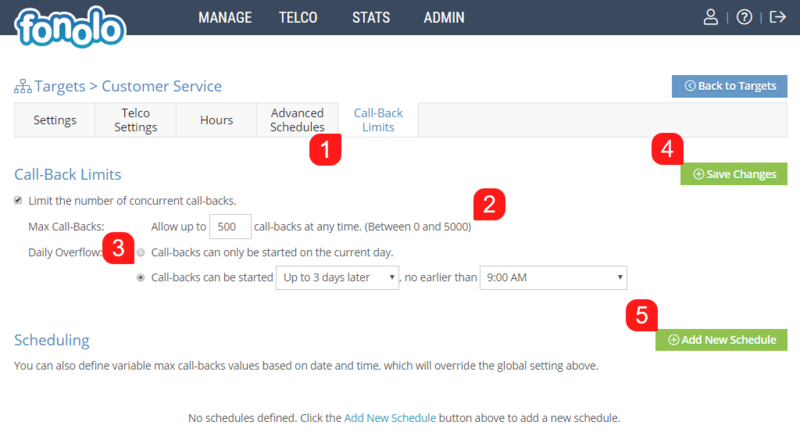 Fonolo Users can select that call-backs are only placed same day, or specify the number of days into the future, and the time within those days, that overflow callbacks are allowed. Fonolo Users can define customized Scheduling, and set more precise parameters for when those call-backs are finally made by Fonolo to the ACD. 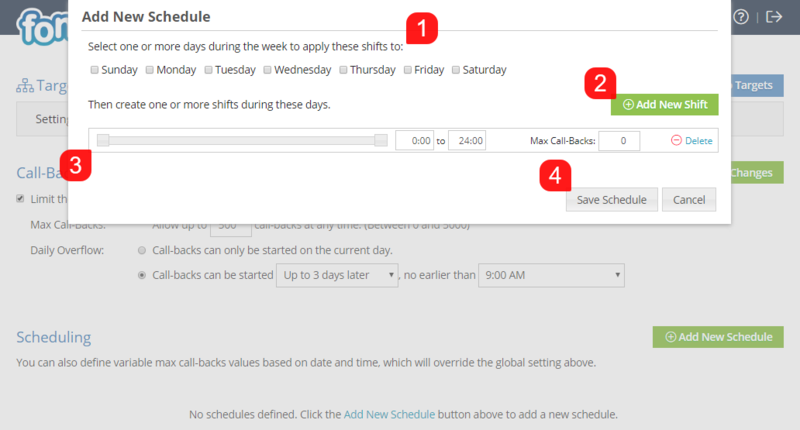 As per the following screenshot, select the days of the week that you want to limit call-backs on (1), and then move the sliders towards the bottom (3) of the pop-up to create the first shift that call-backs can be offered within. Additionally, you can have multiple shifts on each day; these can be added by clicking the green ‘Add New Shift’ button (2) in the above screenshot. Lastly, click the Save Schedule button (4) at the bottom of the pop-up box. Each individual Custom Schedule that you create is divided into ‘shifts’, where each weekday selection shares the same hours to receive callbacks on. In the example below, call-backs on Monday and Wednesday have been permitted between 14:00 to 16:00, but on Tuesday and Thursday, call-backs have been permitted between 11:00 and 13:00. In this case, the Client would have two separate schedules, as shown below. Once all of the settings are correct, click the green ‘Save Changes’ button in the top-right corner of the page. This guide will explain how to set up Call-Back Limiting globally for your Fonolo call-back service.